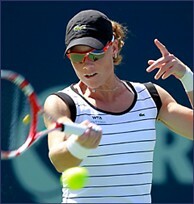 Southern California Open wild card Samantha Stosur won the US Open women's singles title in 2011. Carlsbad, Calif. - Former US Open champion Samantha Stosur of Australia and 18-year-old American Allie Kiick have accepted wild-card entries into the main singles draw of the Southern California Open, scheduled for July 27 - August 4 at the Omni La Costa Resort and Spa, tournament officials announced. Stosur, currently ranked No. 13 in the WTA singles rankings, reached the French Open singles final in 2010 and captured the US Open singles championship in 2011. The 29-year-old, who will make her fourth career appearance in Carlsbad, achieved a career-high ranking of No. 4 in the world in early 2011. Kiick, the daughter of former Miami Dolphins running back Jim Kiick, is ranked No. 294 in the WTA rankings. In March, Kiick captured her second career USTA Pro Circuit singles title in Gainesville, Fla. She will be making her debut in Carlsbad. "We are very excited to give Samantha Stosur, a former US Open champion, and Allie Kiick, a bright, up-and-coming player, the opportunity to play in the Southern California Open," said Tournament Director Alastair Garland. "These two wild-card entries add depth to an already strong tournament field." The Southern California Open, a WTA Premier 700 tennis event and a major stop on the Emirates Airline US Open Series summer calendar, also announced that qualifying singles wild cards have also been given to former Wimbledon semifinalist Alexandra Stevenson, China’s Xue Zhang and San Diegan Zoe Scandalis, who plays collegiate tennis at the University of Southern California. Highlighting this year’s tournament player field will be current No. 3 and 2013 Australian Open champion Victoria Azarenka of Belarus, 2011 tournament champion Agnieszka Radwanska of Poland, who is ranked No. 4 in the world, and defending champion Dominika Cibulkova of Slovakia. Other players who have committed to play in the Southern California Open are No. 7 Petra Kvitova of Czech Republic, No. 11 Roberta Vinci of Italy, No. 16 Jelena Jankovic and No. 17 Ana Ivanovic of Serbia, and 2010 Southern California Open champion Svetlana Kuznetsova of Russia, ranked No. 27 in the world.